Have you ever heard the expression – “You want to hide something? Put it on the second page of Google!”. This is our reality nowadays. When looking for something online everybody is more prone to taking the easy route and just grabbing whatever comes first then searching thoroughly. Consequentially, this is also the reason it’s essential for your site to be on top of the pile and one of the first things your potential visitors/users will see when searching for content that interests them. Learn more about keywords, how to get the best of them by using @SEMScoop, and try your luck because three random winners will get this amazing tool for free! SEMScoop is a service that can immensely help you with your SEO optimization by giving you the best keywords to use based on extensive analytical information. We’ll go over the main features and who knows, maybe by the end we’ll even throw in a few surprises for you – a giveaway where three lucky winners will get a free SEMScoop license! If you are here just to participate in the giveaway, click here and good luck! Briefly touched on in the intro, before we go any further, let’s try to get a good grasp on why SEO and keywords are so important for your site and what a keyword research tool like SEMScoop actually is. SEO or Search Engine Optimization is one of the key aspects of creating, growing and maintain your sites’ presence on the web. In a nutshell, it’s your online visibility in search engine results, not counting paid results, and it’s important to start the right way. Imagine for a moment how many individual searches are done daily on Google. Now imagine how many of those pertain to content your site is running. If you have excellent SEO your site will be in the top results, if you don’t it’ll be further down the line (meaning less of a chance someone will actually scroll enough to even see it). It’s plain to see the marketing potential in this. Being seen and raising your traffic without having to put money into it is a site owners dream. Keywords are one of, if not the most, important tool in obtaining a better SEO. A good combination of keywords can easily push you over the top and make your site stand out in a crowd. Coming up with good keywords to use is a job for a keyword research tool – one such as SEMScoop. As already mentioned, you’ll be getting a complete rundown of how a word or combination of words performs in a search engine, as well as, alternate suggestions and in turn giving you a chance to shift your focus when emphasizing your content. In its essence, SEMScoop works just like a search engine in itself. You’ll insert a keyword or phrase, put in the search parameters (language and location) and you’re off. The language and location input is very important because the results will vary based on those parameters. You should make it as specific as possible – going to broad (i.e. leaving them blank) will overwhelm you with unneeded and overly complicated you won’t be able to use properly. At first glance, you’ll probably be in awe of all the information you’re presented with but don’t worry it’s actually quite straightforward after you get into it. We’ll go through it step-by-step to cover all the important elements of the analysis. For this analysis, we’ve used the term “football drills”. The first thing from your left is the keyword ideas list. Here you’ll be presented with variations of your initial search. This is great for helping you come up with ideas that convey the same message you want but are more optimized. These results can be further filtered, sorted and even saved and exported for future use. Additional options such as these will put you in a better position to find what you’re looking for. 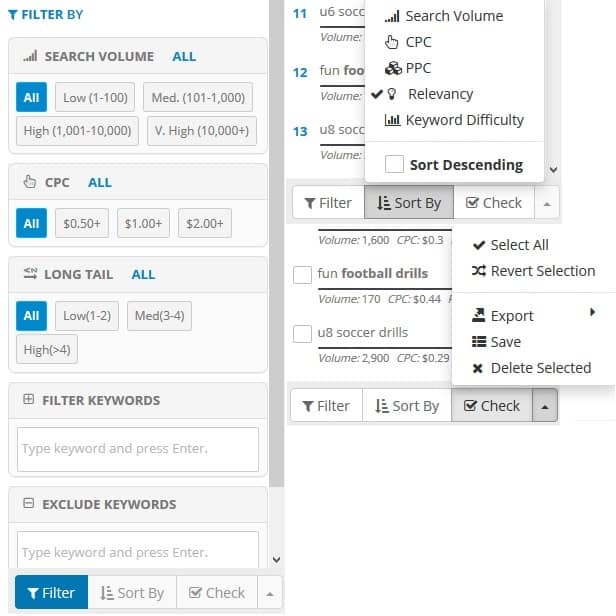 When filtering you’ll be able to add more keywords to the search or remove some of the ones you don’t want. One important thing that may be looked over is the long tail and medium tail options. Usually, long tail keywords will get better scores because the more words are used, the more unique it will be making it easier for a search engine to rank. Add to that the CPC (cost per click) value and the search volume (number of times the term was searched in the last 12 months) and you quickly go from a list of hundreds to a dozen or so best choices to use for maximum effect. Finally, you’ll also be able to save, export or delete the performed search after you’re done with it. On the center and main part of the page, you’ll be presented with a host of various statistics concerning your searched keywords. First among them are average general stats on top. Below them, you’ll get detailed information regarding actual sites who are ranked on Google by using the same keywords you’ve searched. The far top stats we’ve already covered (search volume, CPC etc. ), but now we have even more information to look through. It’s important to note once again that these are average numbers pertaining to your keywords, so while they make a good reference point actual number can and will vary. Domain authority – the average domain authority presents a sites’ ability to rank higher in search engines when using the keywords (the scale is 1-100, the higher number is better). Domain age – shows the average age of domains (how long it’s been registered and active) using the keywords. Longer activity means it’s more trustworthy and therefore ranks higher. Referring domains – gives you the number of other unique domains which have at least one link referring back to the top ranked pages. Content size – simply gives you the average word count on sites or blogs using the same keywords. You should look to be close to, or above this number. If you want even more information you’re in luck. Aside from the average numbers, you’ll also be able to check how the top-ranked results measure in these metrics. We’ve singled out the first, fifth and tenth site, just to give you a comparative example of how the numbers stack through the ranks. 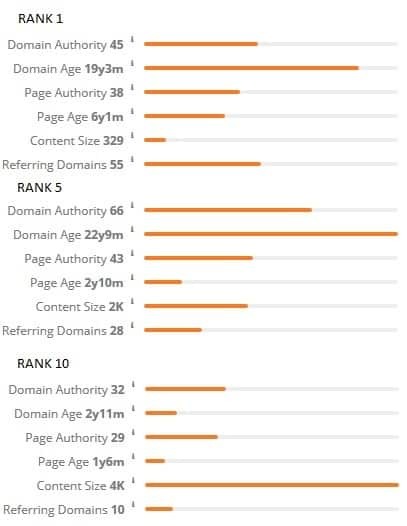 Note that the page authority and age are the same as domain authority and age just for specific pages that contain the keywords. Diving even more into the stats pool you’ll also be able to check out the links profile, content analysis and social engagement for the top ranked sites. Content analysis lets you, just as the name implies, check to what degree is the content saturated with the chosen keyword. OnPage score – shows how optimized and focused the general content is in regards to the keywords. The focus is greater if the score is higher. Keyword density – show how often the keyword is used compared to the total word count. Social engagement – gives you information about mentions, shares, likes etc. on social media platforms. With all the content and features covered, it’s time to see how much this will all cost you. You can see the prices really aren’t that high and you even have a free option that is limited by the number of uses and not available features. If you opt for the annual billing, you’ll receive a discount on the total price making the service even more affordable. We’ve already mentioned constantly throughout the article how important internet presence is for a site. Your site has very limited non-paying options to raise its rank among all others out there vying for their spot under the sun. SEO and by extension keywords are your best bet for keeping up with and surpassing the rest. With most internet browsers offering a search engine as a homepage and most of using it tens if not hundreds of times a day you really can’t afford not to seize your opportunity. The reality is, you should be looking at this aspect of running a site as an advertisement, take full control of it and reap the rewards, especially if using a premium tool such as SEMScoop. Published on November 24, 2018 by Matej Milohnoja. Filed under: giveaway, seo. Thanks for participating! Don’t worry, you can still win! Just make sure get as many points possible; good luck. I think their services are really so cheap and comfortable for a new freelancer who has not enough budget to buy highly cost paid tools.I want to all of my subscribers that you can check it first after that you will be the real beneficiary.